These ultra bright RGB LED modules are perfect for making advertisement signs, light boxes and other back lighting projects that require a bright and flexible LED lighting. LED modules are the most versatile LED lighting product for making professional looking super bright LED light panels. The starter kit includes 20 RGB LED Modules of 8cm each, each module is self adhesive and can be twisted or arranged to fit your design. The 7cm wires between each module will allow you to group your modules closer from one another or further apart to get exactly the required lighting for your project. The total length of the 20 Module kit is 3 meters. It is possible to connect up to 5 sets of 20 modules to a single circuit for a total of 300 LEDs which, when completely extended, can stretch to an amazing 15 meters. To add more modules to your basic bundle, simply use the drop down menu, each extra set of 20 Modules is $25. If you purchase more than 2 extra sets, we will upgrade your power supply to a 12V 6A at no extra charge! To buy more than one RGB LED Module bundle with different numbers of additional modules, simply add the bundle including your desired number of sections multiple times to your cart. We have 2 types of LED modules, RGB and Cool White. The RGB LED Modules will enable you to create up to 16 different colors with the included remote. 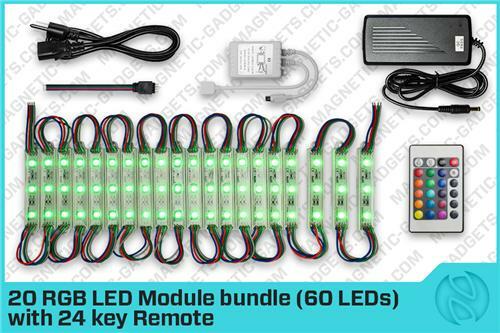 The cool white LED module bundle includes a dimmer and a remote. The Cool White LED modules are the brightest and most widely used type of LED lights for making advertisement signs and panels. Simply use the drop down to select the color. Note that there is no quick connector for the RGB LED modules, to connect your modules to your controller, you must manually connect your wires (R, G, B and +) to the controller using the included connector with wires. To do so, simply twist each colored wire together and isolate with electrical tape. For the Cool White bundle, simply clip the red and black wires in the dimmer.